The World’s most famous city for Love and Romance, the unique setting for Shakespeare’s Romeo & Juliet and one of Italy’s most captivating and highly sought after locations for an Italian Destination Wedding. Verona has been a UNESCO World Heritage Site since 2002 and every move you make, every step you take in this special place will fill your eyes and your hearts with wonder and joy at the cultural heritage and wealth of artistic monuments and treasures within it’s historic walls. Just when you think that you have found a little gem or a view that can’t get much better, you turn a corner and find another one to take your breath away. Verona is a treasure chest of cultural and artistic wealth but famous also for some of Italy’s best food and quality wines. Many of the musician we use are members of this famous orchestra and chorus. The romantic Castelvecchio bridge which spans the River Adige and when lit in the evening is so romantic with the city lights reflecting and sparkling in the water. The elegance of Piazza Dei Signori with the dramatic Scala della Ragione being a stunning location for picture shots. Piazza delle Erbe with its street cafes and restaurants, a great place to sit and people watch. Also a great place to have a pre wedding dinner, we have a superb restaurant here which is ideal. Castel San Pietro, a castle set on the hill above the city and proudly looking down on its treasure chest below. Again a romantic spot to share some time alone and take in the view of the stunning location you have chosen to become Man and Wife. The Giusti Gardens , Italian gardens at their best and again stunning for photos. Il ponte di pietra an old roman bridge reflecting in the river. 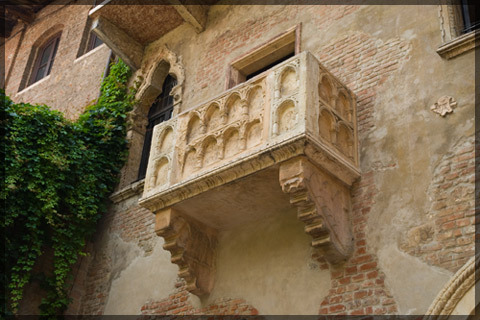 Of course there is also the famous Juliet’s House with the famous balcony and Juliet’s Tomb for those of you on the trail of our famous lovers. Juliet’s Tomb is also a location used for civil wedding ceremonies. But you will be the famous lovers in Verona this time round. If all that isn’t enough then add the stunningly beautiful and tranquil setting of the Valpolicella area. Gently rolling hills, hilltop villages, rows of cypress trees, olive groves, fruit orchards and vineyards producing the famous Valpolicella, Recioto and Amarone wines. We will make you feel that you have not just come as a visitor to a foreign land but that you have come into our home and have become part of our family. That is the least we can do when you decide to trust us with the most important day in your life. That is why when you choose Verona and Villa Giona as the setting for your wedding day, we feel so proud and honoured to have you here and we will put our whole hearts into making sure that it is a day you will remember and cherish forever. SAY I WILL in VERONA - THAT’S AMORE!